I was recently contacted by Nikki on the behalf on Marks & Spencer to take part in a competition to style a dress from their collection, themed on what you would wear on holiday. Now as I'm not much of a partier for places like Ibiza, & I get bored & restless after a few hours on a beach, a place like Paris is perfect as a holiday for me. I love visiting museums & art galleries or visiting historic places, I love sipping coffee, long walks & eating good food whilst I am on holiday so I chose the pretty parisian capital as my destination. I think that this little collared dress is simple but tres chic for a day out in Paris. Comfortable yet stylish whilst visiting the Louvre, nibbling Macaroons at Laduree, or having a sunny stroll along the Seine. 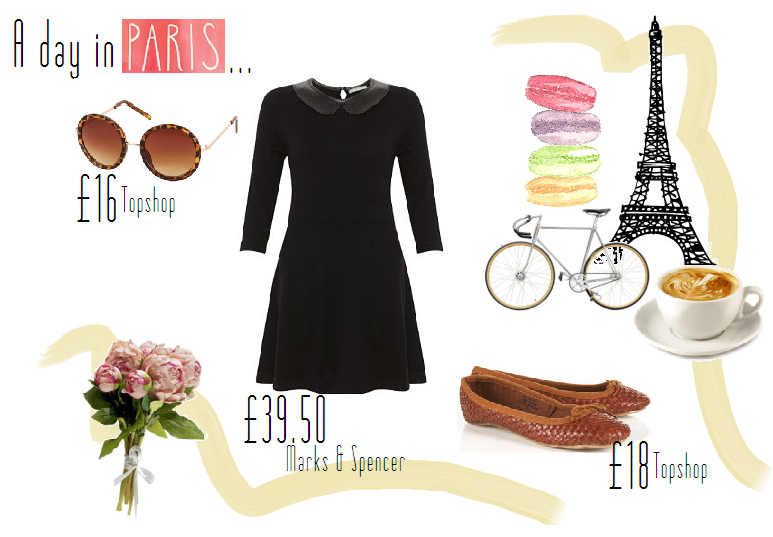 I love the glasses & the woven shoes from topshop & adore the delicate detail on the leather collar. With this outfit being within a £70 budget, I love the outcome. I haven't got any holidays lined up with friends but at least I do have the one luxury that is V Festival next. I cannot wait! Meanwhile, I bought this pretty blue dress from ASOS the other day & have been putting together little outfits & how I could wear it. I can't get enough of that blue colour! So here's a little set on some things from ASOS that I would pair with it.